There is nothing visible on the hull of the Constitution class refit that could be particularly interpreted as lifeboat hatches. The same goes for other ship types of the mid and late 23rd century, like Excelsior and Oberth. This may be the reason why the TNG Technical Manual states that ASRVs, as they can be found on the Galaxy class, were not introduced prior to 2337, namely on the Renaissance-class USS Hokkaido. But this mention could specifically refer to this new type of autonomous escape pods, rather than lifeboats in general, which should exist much longer. Actually, there is canon evidence of lifeboats on the freshly refitted Enterprise in "Star Trek I". 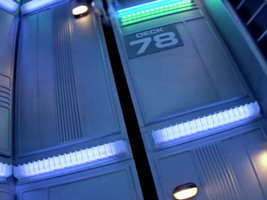 Just after Kirk has stepped out of the airlock, the view of the cargo area shows a door labeled "Lifeboats" on one side. These lifeboats would be located in the side wall of the engineering hull. 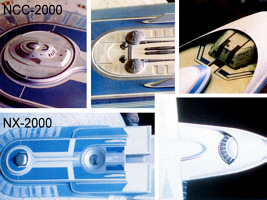 These lifeboats are visible in the engineering hull of the refitted Enterprise on a cross-section that was printed in magazines at the occasion of TMP. 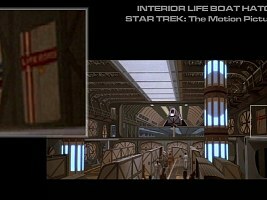 Another, much more prominent mention of lifeboats comes from the Kobayashi Maru simulation in "Star Trek II" when Saavik orders the crew to abandon ship. The Star Trek Encyclopedia III depicts a label from the Enterprise-A with emergency evac instructions, mentioning lifeboats. Evidence about lifeboats on the Enterprise-B comes from the MSD in "Star Trek: Generations". There are several small hatches on the saucer labeled "Life boat hatch". 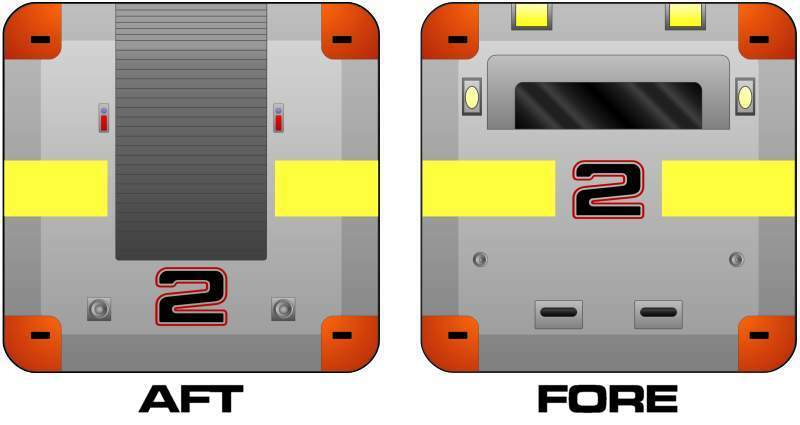 These do not necessarily match with hull plates, but we could imagine that the lifeboats, on both ship types, are hidden underneath break-away plates like on the Defiant too (DS9: "Valiant", "The Changing Face of Evil"). Although it seems too complicated to blow away a piece of the hull instead of simply opening a hatch, we can accept this if the lifeboats are not designed to rejoin the ship. In light of this evidence, it is safe to say that there must be lifeboats on the Constitution refit and Excelsior refit and probably on other 23rd century starships too. We also know that starships of the Oberth class (TNG: "The Pegasus"), Miranda class (DS9: "Emissary") and Constellation class (TNG: "The Battle") have lifeboats in the 24th century. There is no reason to assume that these were not aboard when the ships were commissioned, especially since their outer appearance has not changed. Finally, T'Pol negates Hoshi's and Malcolm's assumption that the crew of the Klingon Raptor class in ENT: "Sleeping Dogs" could have left the ship, as Klingon ships are not supposed to have lifeboats (This obviously changes until the 24th century, when Worf survives the destruction of the IKS Koraga in a lifeboat in DS9: "Penumbra", and is even blatantly contradicted in ENT: "Bounty" when we see a 22nd century Klingon lifeboat). Conversely, we can conclude that Earth and Vulcan ships of the 22nd century do have lifeboats. In "Star Trek (2009)", when Spock wants to get rid of troublemaker Kirk, he has Kirk put into a lifeboat and jettisoned. This lifeboat is unlike the spacious types that we know from the 24th century. It is designed to hold just one person. We can see that it is launched from what looks like a normal docking port in the ship's neck. 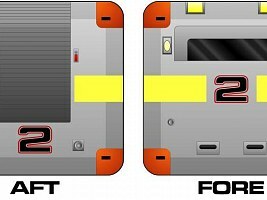 Since there are no visible lifeboat hatches, we would expect the majority of (most likely bigger) lifeboats to be hidden behind break-away plates. "Star Trek Beyond" introduces an additional type of small lifeboats, the "Kelvin pod". This lifeboat is apparently designed to save the bridge crew, who otherwise might have to "go down with the ship", like George Kirk on the Kelvin. Kirk and McCoy take the "lift" (Spock with rocket boots) inside the turbolift shaft in "Star Trek V". While they are climbing, we see them rapidly passing sequential deck numbers. But something's very strange about them - they count upwards, unlike on any other Federation ship. 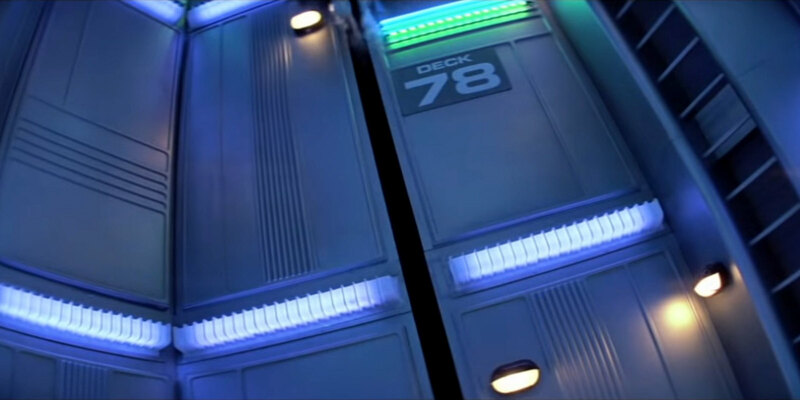 And near the top, the three are passing a label "Deck 78", although the ship has only 21 decks (perhaps 23, depending on the source). So do we need to take into account this scene from "Star Trek V"? Does it even supersede everything that we have ever learned about the design and sizes of Federation ships? Certainly not. Fans have made up weird explanations, for instance that a robot mislabeled the interior of the shaft or something like that. But maybe we should just take it as what it is - an incredibly pathetic attempt to make the turboboot ride more exciting. Purportedly Shatner himself insisted that there be more than 70 decks on the ship, against everyone's advice. So it does not really deserve our attention. Let's simply ignore the stupid numbers. At the time of TOS the only Federation starship class seems to be the omnipresent Constitution or "Starship class". 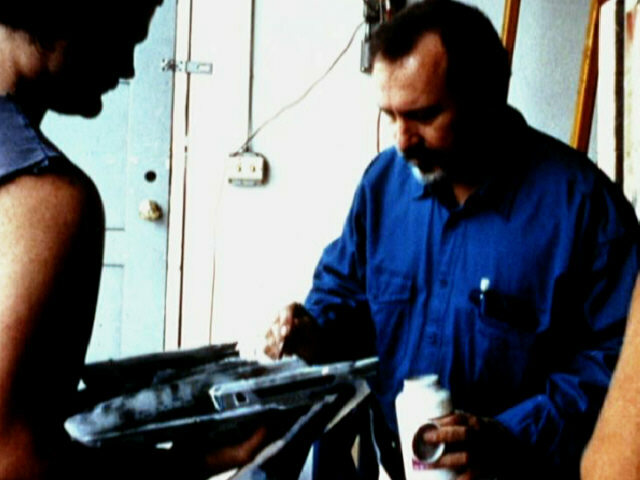 It is obvious that the small budget for visual effects in the 1960's did not allow to build a lot of different models. However, it would not have been necessary to classify virtually all ships that were only mentioned or listed in TOS as Constitution class too, as done in the Star Trek Encyclopedia. The problem becomes worse considering that Kirk said that there are "only twelve of them" in TOS: "Tomorrow is Yesterday". It seems dubious that the Enterprise should encounter virtually all of her classmates, but very few Federation ships of different types - unless Starfleet really has that few other ships. The Encyclopedia admittedly makes up several Constitutions, which were never canonically seen or mentioned to be of that class. Anyway, if we choose to accept these, we should not go even further and assume that there are still more ships of the class, even if some of the registries of ships listed in TOS: "Court Martial" and in "Star Trek VI" would fit perfectly. Which was first, Miranda or Constitution refit? 1. The Miranda as we know her might be already a refit, and there could be an unseen "TOS-style" Miranda. In this case Miranda and Constitution would have been further developed in parallel, and there would be no need to explain if and which of them came first. The Constellation would be a "cheap" new class that profits from the experiences with the Miranda and the Constitution. The explanation, however, why Miranda-class ships (unlike the Constitution) are not only in use but still being built in the 24th century would be rendered much more difficult if the basic design were that old. A newly built ship is a whole different kettle of fish than a refit, and it would require to follow different plans. 2. 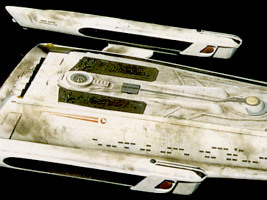 The Miranda class may have been commissioned in the 2260's as a new ship and therefore predates the Constitution refit. Perhaps the nacelle construction of the Miranda proved good and was adopted for the other classes. The outer appearance of the extended saucer of the Constitution refit would only "imitate" the Miranda style, while the saucer core would be still from the original Constitution - which is necessary to justify that the refitted Enterprise is still Kirk's old Enterprise. In this case the Constellation would seem much like a larger and more powerful version of the Miranda. 3. 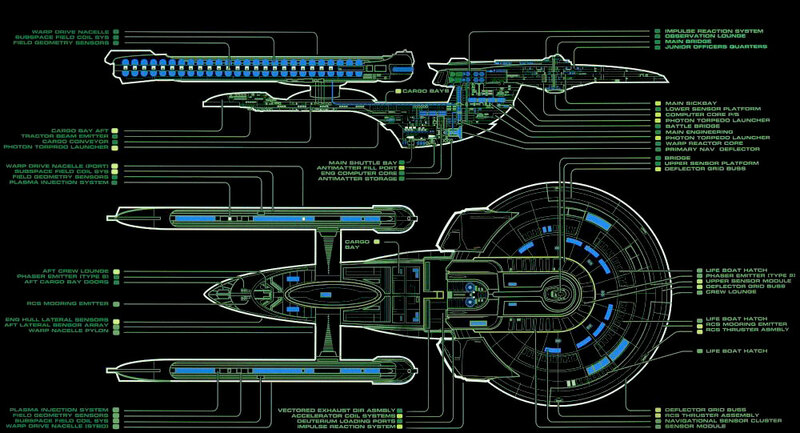 If the Constitution refit was first, it would seem that the Miranda uses re-arranged parts, in particular the nacelles. Nevertheless, the saucer would be rather a completely new construction, considering that there is an angular saucer extension and that the warp core must be inside the saucer. In this case, the Constellation would have been developed in parallel to the Miranda. It is not really a problem, but worth the question why the design of the Miranda as a new class has taken the same direction as that of the Constitution refit, although the conditions should have been considerably different. I wouldn't necessarily rule out the existence of a "TOS Miranda" (1. ), but 2. and 3. seem more plausible, with slight advantages for 2., since a refit is more likely to use components of a new class than vice versa. In an article about the Constellation in Star Trek: The Magazine, Rick Sternbach conjectures that there was indeed no "TOS Miranda", albeit only in a side note. He writes: "When the Miranda and Soyuz classes also became major out growths of the refit program, the production lines expanded, ultimately involving a total of three Starfleet yards." After there had been a misunderstanding about this statement, Rick confirmed in an e-mail to Kris Olinger that this statement really referred to the Constitution refit program, so Miranda and Soyuz are new classes. We know that the Enterprise-A was replaced by a new ship, the Enterprise-B of the Excelsior class, in 2293. The Enterprise-A was either built or completely refitted and renamed in 2286, so it would be only seven years old by then. Why should Starfleet retire a new ship? Was it because of the battle damage? Or was the complete class scheduled for retirement in 2293? Concerning the particular retirement order at the end of Star Trek VI, read the article on Uncertain Ship Names and Registries. The original USS Enterprise NCC-1701 entered service in 2245 (Star Trek Encyclopedia). Unless we make up a "pre-history" to explain the low registries of some ships of this class, she would be the second ship just after the USS Constitution NCC-1700. 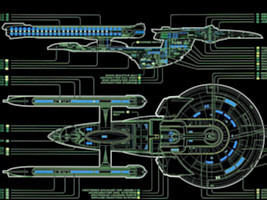 Considering that the Galaxy class is supposed to last 100 years (TNG Technical Manual), an overall lifetime of 50 years for all ships of the Constitution class doesn't seem to be very long, especially since we can assume that many ships have undergone a complete refit like the Enterprise. Moreover, the Miranda and Constellation, whose basic components are apparently the same as of the Constitution refit, have been in service for more than 80 years, so why shouldn't the Constitution too? 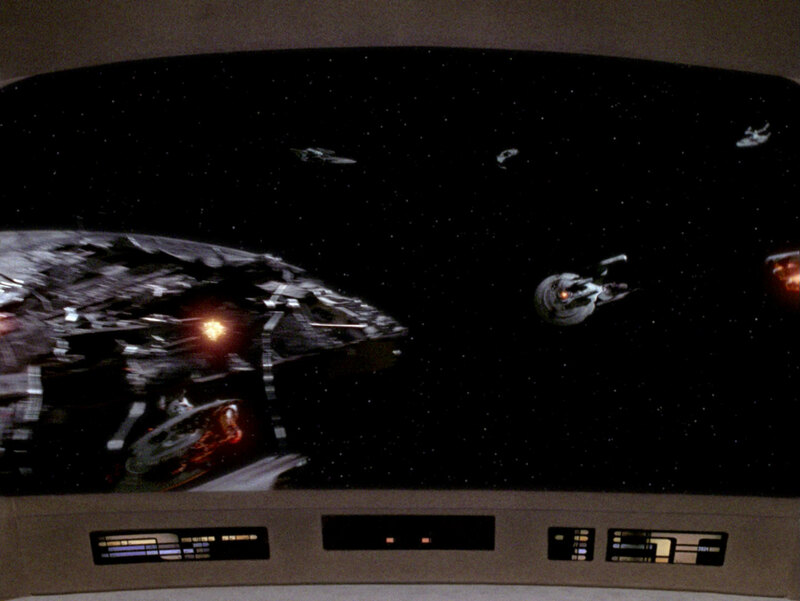 When Picard meets Scotty on the holographic bridge of the original Enterprise (TNG: "Relics"), he says that "one like this is in the Fleet Museum". This doesn't necessarily imply that the ship in the museum is the only one left. But if there were any more of them, wouldn't Picard rather mention that there are Constitution-class ships still in service, to make Scotty feel better? On the other hand, "one like this" might specifically refer to the original configuration Constitution, of which there is only the one in the museum, whereas several of the less interesting (to Scotty) refitted ships might be in surplus depots or perhaps even in active service. The starship debris at Wolf 359 (TNG: "The Best of Both Worlds II") shows a Constitution secondary hull and a saucer. This is probably the one of the Enterprise blown up in "Star Trek III". At least the secondary hull with its typical vat shape and the six large windows can be clearly identified. Unless we invent a new class which has the same old secondary hull but is for some reason still in service, there must have been at least one Constitution-class ship at Wolf 359, and obviously this can't have been the museum ship mentioned in "Relics", two years later. Summarizing, there are advantages for the assumption that the Constitution class is still in service as of 2366. The screen evidence in BoBW is too obvious to be ignored. Considering how dominant the Constitution class was in TOS, it is plausible that this class should have a very long service time, like the Miranda, Constellation, Oberth and Excelsior too. Picard's statement in "Relics" is easy to interpret as the ship in the museum could be the last existing ship in the original configuration. The only remaining problem is that the Enterprise-A was retired before her time. 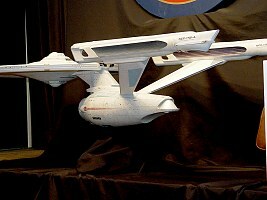 A possible reason why the Enterprise-A and possibly other ships of the class were scheduled to be retired at the end of "Star Trek VI" can be found in the movie itself. At the initial briefing one of the admirals speaks of "mothballing the Starfleet". He is certainly exaggerating, but more precisely he could refer to a bilateral arms reduction treaty. Such an agreement may easily include several ships of the Constitution class as a typical frontline type of vessels. In such a scenario Starfleet would prefer their (provisional) retirement over that of the newer Excelsior class. Miranda-class starships are still in active service in the 24th century, some of them with high registries such as the second Saratoga NCC-31911. It is unlikely that there are on one hand dozens of different starship classes at a time, and on the other hand one of them survives several generations of other designs. If we nevertheless suppose it is customary to build a design for more than 100 years, why was the Soyuz class that seems to be a further development of the Miranda taken out of service more than 80 years before, as stated in TNG: "Cause and Effect"? The four characteristic sensor pods and the lack of the weapon rollbar suggest that the purpose of the Soyuz is significantly different than that of the Miranda. It is possible that the Soyuz was a specialized type of which only a few were completed for missions like border surveillance (perhaps as a 23rd century equivalent of AWACS). When the Soyuz class was not needed any longer, they might have been retrofitted to standard Miranda-class ships, rather than decommissioned. If registries are strictly chronological, the USS Copernicus NCC-623 and USS Grissom NCC-638 suggest that these two ships of the Oberth class were already in service in the 22nd century. In this case they would have been already 100 years old when they were still in service (and in good shape) in the late 23rd century. The rationale for their rather "modern" appearance (similar to the Excelsior) might be that they had been completely rebuilt towards the end of the 23rd century. In the 24th century, however, the Oberth class was not only still in use, but even new ships were commissioned, such as the USS Cochrane NCC-59318, once again under the assumption that registries are chronological. This doesn't make any sense, considering that a refit is something different than a new build. 80-year-old plans for an upgrade of a 180-year-old ship are useless if Starfleet wants to build new ships. Consequently, the Oberth must have been commissioned not before the middle of the 23rd century, already with the appearance we know. There is nothing such as a "TOS Oberth". It seems to be commonly accepted that the transwarp experiment on the Excelsior NX-2000 failed, and that the ship was equipped with a conventional propulsion system some time after "Star Trek III". On the other hand, the only evidence for that can be found in the TNGTM where it is stated that the transwarp project in the 2280s failed, unmistakably referring to the Excelsior: "While the attempt to surpass the primary warp field efficiency barrier with the Transwarp Development Project in the early 2280s proved unsuccessful...". But interestingly, none of the visible modifications to the studio miniature from NX-2000 to NCC-2000 concern the propulsion system. There are two other reasons why a failure of a revolutionary new drive system is implausible. Firstly, the word "transwarp" may be misleading, as it does not necessarily denote a specific technology, but maybe rather any attempt to overcome the limitations of Starfleet's current warp drive, exactly as stated even in the TNGTM. It better would not have much to do with transwarp as employed by the Borg or the Voth, technologies that are obviously far ahead of Starfleet's capabilities during the late 23rd century. If Starfleet's transwarp is a similar technology though, and the Excelsior was already using it, it seems unlikely that Starfleet would give this promising project up and not resume the research for many decades. Secondly, it is strange that an experimental ship, after its failure, would become the prototype of one of Starfleet's most successful ship classes that would be built in numbers of hundreds for several decades. It would fit better if the Excelsior had always been planned to be built in a large scale. In this light it is absolutely possible that what has been dubbed "transwarp" in the beginning is actually the standard type of warp drive in use on all ships since the Excelsior. As it is with many innovations, a new name for it would not come in use if it is not radically different than the old technology. It would even help to explain why the warp scale was changed some time between TOS and TNG. If the function principle of new warp (transwarp) is somewhat different, it may require that all high speeds must be achieved with warp factors between 9 and 10. On the other hand, we may believe in the clear statement in the TNGTM, so the Excelsior's transwarp must be something essentially new, although arguably not as far evolved as Borg transwarp. 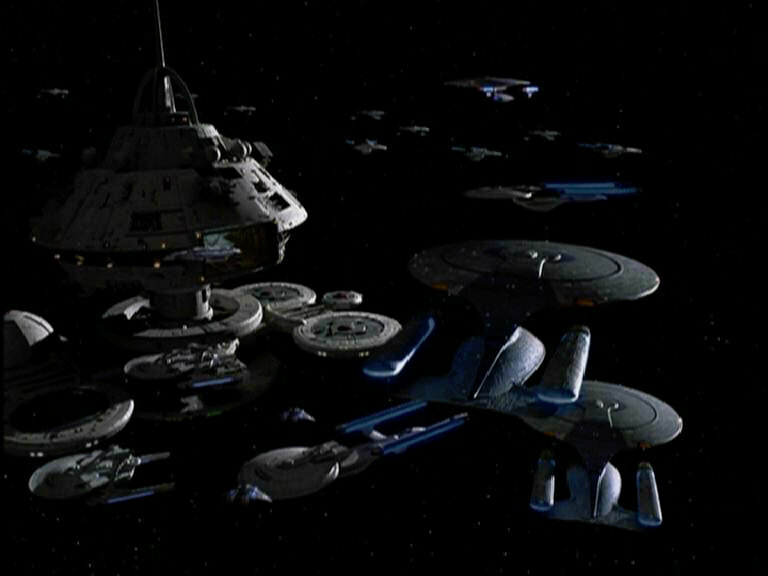 Ships of the Excelsior class are still in service as of 2376, they are even the backbone of Starfleet. But for how long have they been built? Has Starfleet even commissioned new ships of this class only recently? There is some evidence supporting this idea. 1. The registry of the USS Melbourne is NCC-62043, as could be clearly seen in DS9: "Emissary". While the actual reason for the high number is that it was originally supposed to be a Nebula-class ship in BoBW, this points to a commissioning date in the 2350's or 2360's. The second highest known batch of numbers is in the 2340's and therefore about 20 years earlier. 2. 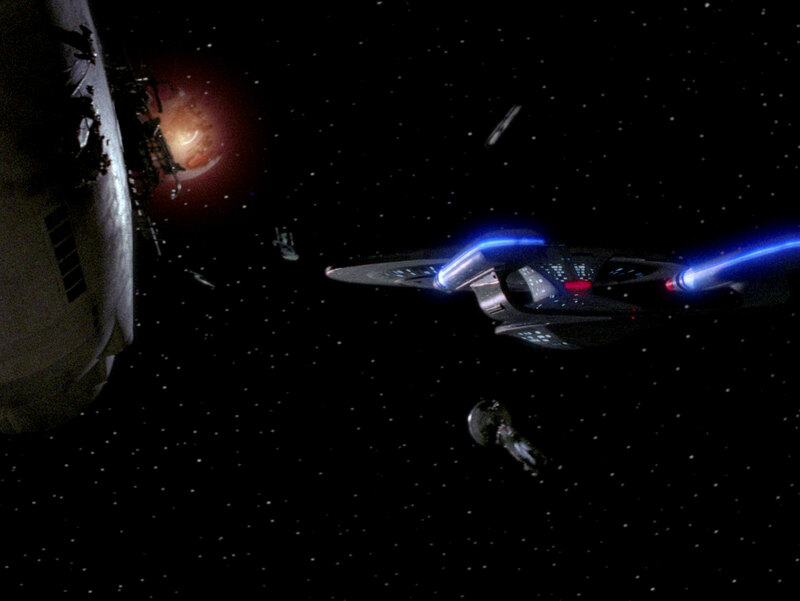 The USS Farragut NCC-60597 (Nebula class) was destroyed in DS9: "Nor the Battle to the Strong". In DS9: "Chrysalis", however, there is a USS Farragut again, and the Star Trek Encyclopedia III claims that the Excelsior class seen in the episode is actually this ship. The speculation given there, however, is that the Excelsior-class Farragut "was an older ship that had predated the Nebula-class vessel and had been decommissioned, but was pressed back into service during the Dominion war after the destruction of the Nebula-class ship". 3. There were a few Excelsior-class ships in drydocks at Utopia Planitia in VOY: "Relativity", so they might still be under construction as of 2371. Refuting the last argument is relatively easy, since there is no reason why Utopia Planitia should exclusively build new ships. The shown Excelsior-class ships may easily be there for repairs or upgrades. Moreover, one registry is visible as "NCC-42111", which is likely would not belong to a new ship as of 2371. It is the USS Frederickson that will take part in the Dominion War a few years later (DS9: "Behind the Lines"). Pertaining to point #2, I assume that the Excelsior-class ship at DS9 was indeed intended to be the USS Farragut, and it was just insufficient research that there is no plausible continuity to the Nebula-class ship of the same name. Mike Okuda came up with a very good rationalization for the Encyclopedia, whereas the suggestion that the ship is either new or, as has been speculated too, renamed to Farragut, seems less plausible. Anyway, despite Okuda's apocryphal explanation the ship seen in the episode could be anything else, after all there were supposed to be dozens of ships (the Ninth Fleet) close to the station at that time. The toughest case is the USS Melbourne, whose registry could be clearly identified. While the registry of the USS Zhukov NCC-62136 (whose number was mislabeled and should have been NCC-26136) is already a problem, why should a ship of the far older Excelsior class be built so late, and why should it be the apparently only one? Basically, this is the same dilemma as with the new Oberths discussed above. One theory is that the ship might have been mothballed, but recommissioned with a new number in the 2350's or 2360's. Another idea is that the Melbourne might have been built from still available components, maybe as a training for the ship yards or as a tradition ship of Starfleet, much like sailing ships in modern navies. The Enterprise-B seems to be the first upgraded Excelsior class starship, although definite evidence is missing from "Star Trek Generations". Almost all later Excelsior starships have the same outer appearance as the original Excelsior, as if the refit would have failed. Even the fleet scenes in the Dominion War do not show any refitted Excelsior. 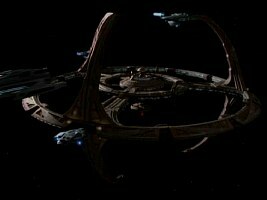 So why is there a single other refitted Excelsior, the Lakota NCC-42768, after 80 years, in DS9: "Paradise Lost"? 1. It is possible that there are more ships like the Enterprise-B or the Lakota, which were occasionally built with special additional equipment. They are rare compared to the standard Excelsior, of which there might be over a hundred ships or more. 2. There are no other refitted Excelsiors indeed. The Lakota is an experimental upgrade of the Excelsior class which only has the same or similar hull extensions, but completely new technology. The Lakota is said to have received a refit in DS9: "Paradise Lost", and the amazement about its upgraded weapons, which are more powerful than on any other ship of its class, may help rationalize the hull extensions -- although none of them seems to be directly related to the weapons systems. 3. The Lakota is actually the very same ship as the Enterprise NCC-1701-B. At some time between 2310 and 2330, Starfleet may have decided to transfer the name to a newer ship, namely the Ambassador-class Enterprise NCC-1701-C, requiring to rename the Enterprise-B. Only the registry NCC-42768 would be a tad too high if the Lakota is in fact the Enterprise-B, but maybe the ship was temporarily retired and later reactivated. Gene Roddenberry once proposed that there should be no more than six starships of the Galaxy class (because he could not imagine that Starfleet would build more of these huge vessels). The TNG Technical Manual heeds this statement. According to the book only six of them were built at first, plus six additional spaceframes which remained incomplete as of 2368 -- corresponding to the fifth season of TNG when the TNGTM was published. So far for the theory. 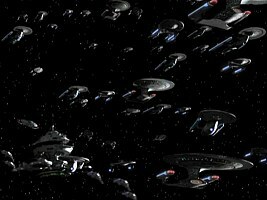 In the very episodes of TNG, DS9 and Voyager, however, so many different ships were mentioned or were even seen at a time that it is difficult to maintain that there are twelve Galaxy-class ships altogether. Until 2371, three of the six original ships were already lost: the USS Yamato NCC-71807 (registry as visible on Picard's monitor) in TNG: "Contagion", the USS Odyssey NCC-71832 in DS9: "The Jem'Hadar" and the USS Enterprise NCC-1701-D in "Star Trek: Generations". With the USS Galaxy NCC-70637 as seen in the battle at Chin'toka in 2374 (DS9: "Tears of the Prophets") and listed in "Star Trek Nemesis" and the USS Challenger NCC-71099 as seen in VOY: "Timeless" two of the three remaining ships are already known. The Challenger most likely belongs to this first batch because the registry is lower than the Yamato's. Apart from these the names of three more Galaxy-class ships are known. The USS Venture NCC-71854 arrived as a reinforcement in DS9: "The Way of the Warrior". It is interesting to note that the Venture is already a class variant, sporting additional structures, probably phaser strips, on the warp nacelles. The USS Magellan was mentioned as the lead ship of a group that could break through the Dominion lines in DS9: "Sacrifice of Angels", and a Galaxy-class vessel was shown - albeit stock footage from the above arrival of the Venture. 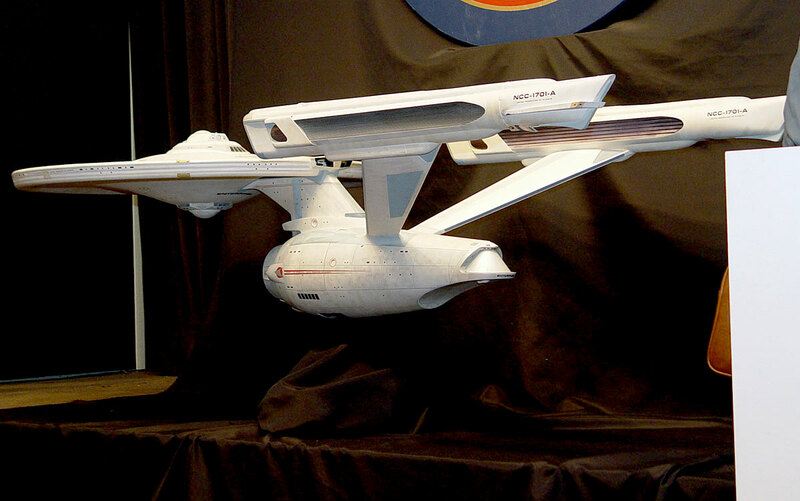 The USS Trinculo NCC-71867 was not actually mentioned, but a studio miniature with this name and number was shown on exhibitions. 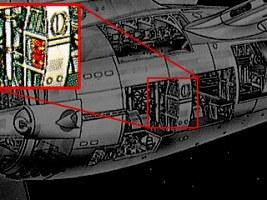 It is absolutely possible that the so-labeled model was used in one or more DS9 episodes. Given the above ship appearances, it is quite obvious that at least most of the six remaining spaceframes must have been activated until 2374. "Dark-neck" Galaxies in DS9: "Favor the Bold"
At least four Galaxies in DS9: "Favor the Bold"
Several Dominion War episodes featured a large number of unnamed Galaxy-class ships on screen, most notably DS9: "Favor the Bold" and "Sacrifice of Angels" where several times three or four of them could be seen at the same time. In addition, two "Galaxy wings" were mentioned as subdivisions of the Starfleet forces. 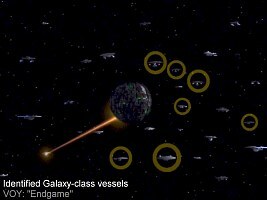 Finally, at least seven ships of the class were visible in VOY: "Endgame". Given these facts, it is not very likely that only twelve ships were built altogether, even if we go with the implausible assumption that each of the remaining nine ships participated in each of the major battles. Although it may have taken more than a decade to build the first twelve ships, there is no reason to believe that a once established design could not be built faster, such as in a six-year period from 2368 to 2374. Since the according section in the TNGTM describes the construction history of the class, it may be justified to presume that it was decided to eventually build more than twelve ships even prior to 2368. Actually, there seemed to be a Galaxy class under construction at Utopia Planitia and the outer hull largely completed in 2371 (VOY: "Relativity"). 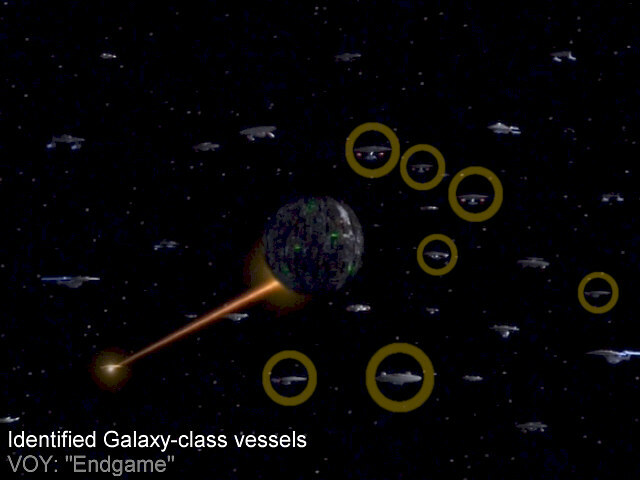 At least seven Galaxies in VOY: "Endgame"
Another point favoring a higher number than twelve is that two Galaxy-class ships shown in DS9: "Favor the Bold" seem to have a darker neck than other ships of the class, which may be a sign of still another variant and hence another batch of vessels apart from the original six (including Galaxy, Yamato, Enterprise, Challenger, Odyssey) and the possibly mothballed spaceframes (including Venture and Magellan). Finally, although I firmly believe that much of the starship section in the DS9TM including the "kitbash" theory is wrong, the idea that new ships were commissioned with "only one third of their internal volume" filled makes sense in particular for the large Galaxy class. Omitting most of the science labs and crew quarters might shorten the building time considerably. 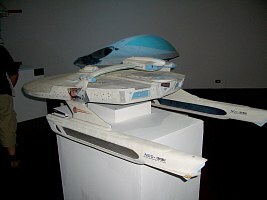 The model of the USS Jenolan in TNG: "Relics" is a redress of the "executive shuttle" used in "Star Trek VI". This is why the Star Trek Encyclopedia claims that the Sydney class is a "small starship resembling a runabout" and that "some Sydney-class starships were built without warp drive, intended for use as a large shuttlecraft". This is nonsense. The original shuttle had only one deck, and a length of about 25m. A look at the photo of the Sydney-class USS Jenolan (labeled as "Jenolin") reveals that not only a Constitution-style warp nacelle, but also a small bridge dome and several rows of windows were added to the model. Owing to the rather small size of the model, the additional parts were taken from an AMT model. It is absolutely safe to say that the Sydney is an independent and much larger ship. Based on the known size of the nacelles, the Sydney class must be around 235m long. Moreover, if the Jenolan were less than 30m long, the diameter of the shield bubble in TNG: "Relics" would have been barely 80m, definitely not high enough for the Enterprise to pass through the already closing gate of the Dyson Sphere. The Fact Files continue with the Sydney-shuttle myth, but ironically they show two incongruent drawings of the Sydney class and the orbital shuttle whose basic shapes couldn't be more different although they are the same in reality! In DS9: "Playing God", "Accession", "Trials and Tribble-ations" (when Dulmer and Lucsly arrive) and "Chrysalis" a Sydney-class transport docks to the station upside down, contrary to all other known starships. Why? It probably didn't have to do with the above silly "Sydney runabout" theory, since the ship appeared to be at least 100m long, already much too large for a runabout. It might have been intended to show a different ship class than the Sydney. Yet, there is no reason why this old class shouldn't be still in service, considering that Mirandas are still around too. I think since it could be clearly identified there is no reason to assume that it isn't a Sydney class, and for some weird reason it had to dock upside down. Sydney-class transport in DS9: "Chrysalis"
The Enterprise Refit of 2271 - "Admiral, this is an almost totally new Enterprise." Thanks to countless people at the Flare Sci-fi Forums, where such weird stuff is permanently being discussed and to Frank'sSWDAO likewise. Special thanks to Dave for additional facts and suggestions, to Stephen for several corrections, to Ruben Hilbers for a hint about lifeboats, to Kris Olinger for clearing up the Miranda/Soyuz issue, to Capeton Yusshuk for suggestions about the Constitution class, to Kurt Fitzner for pointing out to me the quote about the Excelsior's transwarp to Mark for the suggestion that the Enterprise-B and Lakota may be the same ship, to Rogue Vulcan and to everyone else who discussed the number of Galaxy-class starships at the SCN.